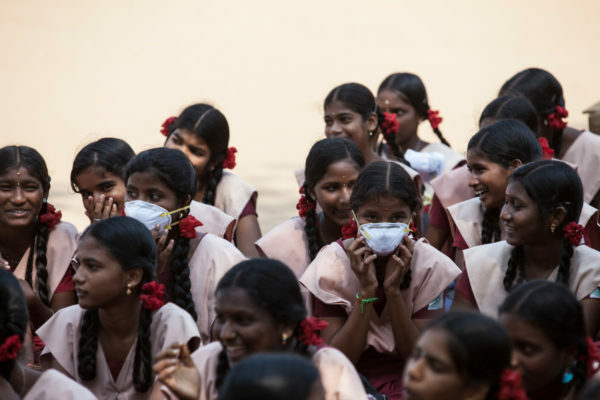 The poisonous air pollution associated with the Indian capital is a country-wide epidemic, with major cities such as Bangalore recording dangerous levels of toxic particulate matter. Air quality monitoring conducted early this month by Greenpeace India at major Bangalore landmarks – from Christ College to the Reserve Bank of India – has revealed PM10 readings massively in violation of national and international safety standards. Particulate matter up to 10 micrometers in size. Not as deadly as PM2.5 but still pretty bad. Often comes from factories and cars. The dirtiest spot in the city, the busy Peenya junction, had peak pollution of nearly 1300 ug/m3 — 26 times what the World Health Organisation (WHO) considers safe, and 13 times India’s own pollution recommendation. The junction’s average pollution reading over 8 hours was 252, which is still 5 and 2.5 times those same standards. The other three spots investigated weren’t quite that bad, but Christ College on Honsur Road had a dangerously high average, and PM10 at the Reserve Bank on Nrupathunga Road peaked at over 1000 ug/m3. Earlier this year, whilst US President Obama was visiting his Prime Minister Modi, air pollution in Delhi was found to be twice as bad as in Beijing, and 9 times worse than the WHO’s standard. According to a WHO report late last year, 13 of the 20 most polluted cities in the world are in India — and Bangalore isn’t even one of them. That analysis was based on PM2.5 data rather than PM10. 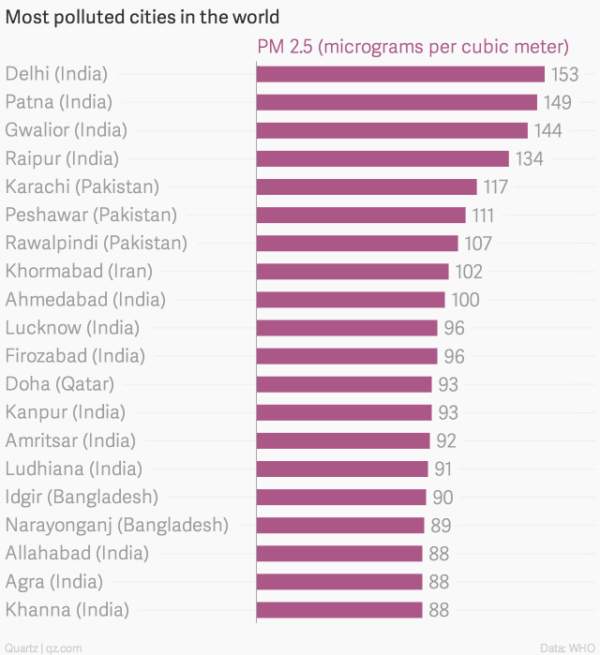 But despite the best efforts of international bodies like WHO, Indian air quality data is sparse. In April of this year, the Modi government launched a National Air Quality Index (NAQI) in 10 cities and plans were made to beef up the monitoring systems in the country’s 46 most populated cities. The initiative is actually being rolled out, but there a couple of noteworthy issues with the data being produced. For one, the government said all cities covered under the NAQI should have at least 6 monitoring stations, but it’s nearly six months later and Delhi’s the only place meeting that target. Bangalore, for instance, has just 3 stations capable of putting NAQI data online. And for two, among Delhi’s 10 monitoring stations only 2 are giving real time data — on the 21st of September 4 of them were providing day-old data, 1 was offering data from 2 days earlier, and 3 had figures from months ago. That absence of data is doing nothing to instil confidence in the Indian people. A new study from Pew Research Centre says an increasing number of citizens see air pollution as a ‘very big problem’. 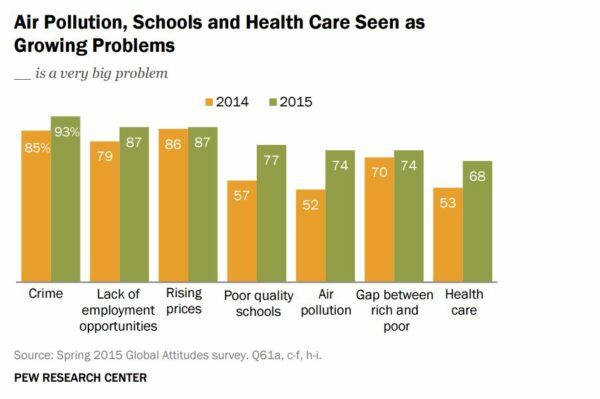 Since Modi’s election last year concern over the country’s pollution problem has risen 22% — It now stands at 74%. If this trend continues, the deadly Delhi smog may come to define this era in India.